Hardness can be deceiving. Despite its reputation for intransigence, concrete is a uniquely subtle, delicate material. The surface of any motorway flyover, housing block or city pavement reveals a spectrum of patinas through which it absorbs and reflects its surroundings. Metal fixings soak rusty stains into their concrete bases; shoes and rubber tyres apply patient layers of dirt and oil onto walkways and roads, and rainwater causes streaks of discolouration (or sometimes just colouration) to develop across walls. Michael Dean exploits his material’s versatility in surprising ways. He makes objects that are at once taciturn monuments to silence, stubbornly refusing our attempts to make them speak, and effusive, incontinent things that betray intricate records of their histories on their outer surfaces. We have concrete to thank for this. Even the mineral content of tap water can dramatically affect the way it looks. It remains porous when hard, so oils from contact with human skin give it, in reply, a familiar, organic quality. Some of Dean’s works have the uncanny appearance of elephant hide, dark whale skin or cured panels of leather; others resemble nothing so much as giant fossils, plant matter preserved and fractured beneath layers of peat bog. All of these associations are, to different degrees, ancient, and make us forget that the sculptures they cling to only recently came into the world. In a sense though, they didn’t. Dean’s sculptures correspond to existing language – the artist quarrying single, monolithic words from sentences or passages of text, and remodelling them in his own prismatic, liminally three-dimensional fonts. Sometimes they become concertinas of interlocking shards, creased and folded planes that only faintly correspond to the letters that we may or may not know to be encoded within them. 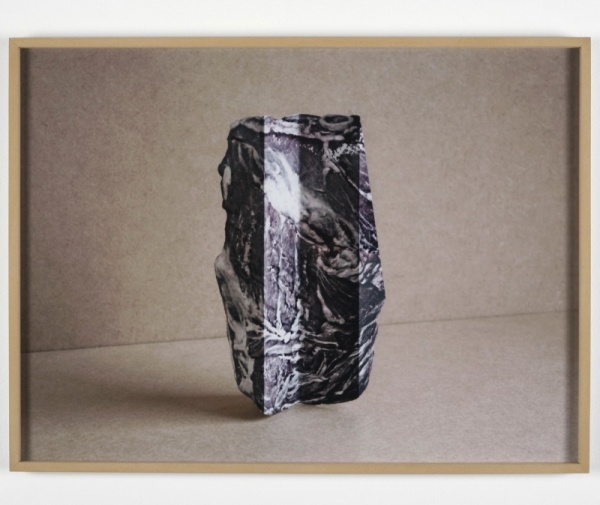 In other cases – as with his recent work pbc (working title) (2011) – they use the impressions of found objects (in that case cabbage leaves) as the staves of letterforms. These objects attest to the formal arbitrariness of alphabets, and to the thick-tongued inadequacy of our linguistic modes of communication. They are more akin to sounds than to words. Elsewhere, photographic prints become the material that Dean reconfigures and then rephotographs, in a Byzantine process that moves back and forth between the world and its mediation, winding up in an image that seems to describe something stranded halfway between the two. A recent series begins with lumps of wet viscera and ends with the documentation of something as dry and delicate as a relic in a museum. Often, as words are translated into object form, they become detached from their original orientation, and rotated, laid flat, or otherwise dislocated from the left-to-right, top-to-bottom structure of the Western page. It is no accident that many of Dean’s art works evoke archaeological fragments. Tablets of script written in ancient alphabets – the Rosetta Stone, for example – are pages that have become disoriented as sculptures, their legibility now usurped by their totemic aura. They make us aware of the many ways of reading objects that have nothing to do with language. Something comparable happens, perhaps, when Dean presents his own writings within his installations. Typically, viewers are encouraged not simply to read his words in the gallery, but to rip a page from a paperback book printed by the artist with a single, repeated page of text. The pages are then taken home, read and reread later on the bus or when removed, crumpled, from a coat pocket at the end of the day. The types of translations that happen through this process are not simply between word and object (and back again), nor out of and back into sense, but are to do with ownership – of meanings as well as of things. Words are vessels, not just for consensual, shared definitions but also for our own privately guarded associations and significances. Most of us tend to forget this. Dean is not concerned with re-presentation but directly with presentation; his work delivers snatches of the world that are not to do with the artist’s own experience, but are ripe to be taken and experienced both by the artist and the viewer alike. He has referred to this phenomenon, in the title of a recent exhibition, as ‘Symmetry of Intimacy’. This accounts, therefore, for his technique of presenting his writings laid out on the page as play scripts; when we find ourselves reading words belonging to a character simply identified as ‘Voice’, we realise that the voice is none other than our own. Dean is not interested in theatre per se – in fact the format of these pages is simply copied directly from found play scripts ­– but he is motivated by the possibility that the viewer might become an active performer in the work. 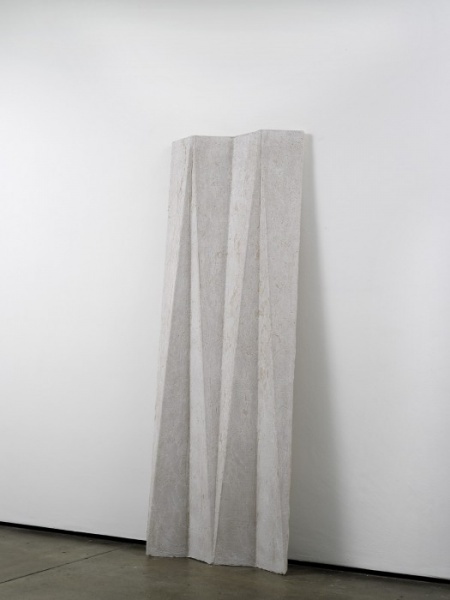 The physical bearing of his sculptures, whether they are balancing precariously on a single point, leaning against a wall or spread out over a patch of floor, is crucial in this regard: viewers become acutely aware of their own physicality in space. If Dean’s sculptures are forms to be read, one way we might read them is with the closeness of our bodies. Reading is, in Dean’s work, a solitary activity. His allusions to performance are pointed towards the viewer’s self-consciousness, in the same way that listening to oneself speak in an empty room induces the uncomfortable sensation of simultaneous intimacy and strangeness. When his sculptures acquire softly reflective patinas on their surfaces they begin to approach the facelessness of mirrors. Ultimately, Dean’s work seems to suggest, we have nobody’s language through which to read the world but our own.